With a chorus of bulls quieted and bears on the prowl, a much stronger opportunity is now knocking in Micron Technology, Inc. (NASDAQ:MU). But for investors ever-respectful of market risk, a reduced- and defined-spread combination strategy on shares of MU is the better way to suit up. Let me explain. It wasn’t that long ago that Wall Street was running amok with bullish, sky-high praise and raises in hand for MU. In front of the late March earnings confessional with shares near $59.50 and following a multiweek tear to fresh intermediate highs, a trio of undeterred analysts came out with aggressively upbeat recommendations on Micron. For a stock already enjoying Wall Street’s full support, Instinet’s target lift from $55 to $100 and notice of MU being “in the early stages of another major breakout” had this strategist’s full attention. More to the point, it quickly had me re-calibrating my outlook as an interested but much more cautious investor and a view I shared with readers at InvestorPlace. Fast forward through what was nothing short of a very strong (but pre-announced) earnings report for Micron and you guessed it; shares have failed to appreciate the long game view of what remains a very determined analyst community. Instead, MU stock has been sweating out the short game with the type of activity all good and great stocks eventually succumb to—namely a corrective move worthy of quieting a crowded trade. In this particular pulling the rug out from under investors, MU shares are off about 18% since earnings. Further, the most recent recommendation was rarer than a UFO sighting, as UBS this week began initiation of MU with a sell rating and a $35 price target. The firm is bullish on the secular long-term story for chip stocks like MU, but less so in light of strong bull runs and what they still view as a cyclical business that’s peaked. 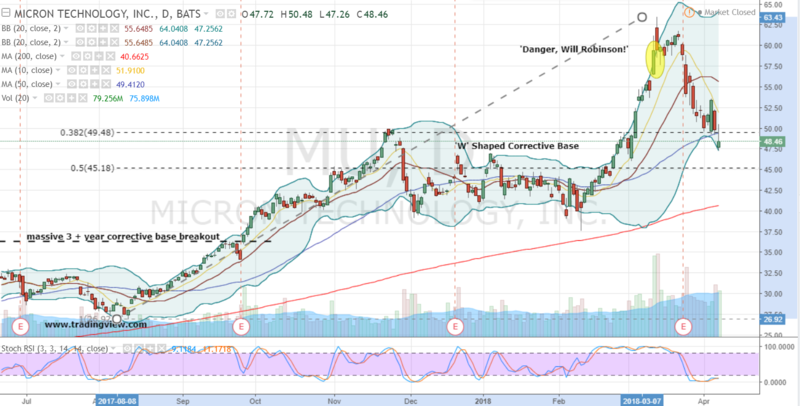 Given what has technically transpired on the MU price chart since doing our own version of the caring and protective robot from the short-lived, but iconic Lost in Space Sci-Fi series; it’s time to be a great deal more bullish on Micron’s upside potential. Bottom line, the current 25% corrective move is both common and healthy following a strong upside move over the past year. This type action is good for removing excessive optimism that can ultimately weigh on shares as most investors had already put their chips in the proverbial pot. Secondly, the technical picture actually looks very supportive without raising the concern of an obvious bull trap. Shares of Micron are sandwiched in-between the 38% and 50% retracement levels and have the backing of the prior cup without appearing too cookie-cutter cute and inviting to the uninitiated. Appreciating that calling a bottom can be a tough business and preferring to simply be in a good financial and mental position to buy on any potential additional weakness; I’ve come up with an unorthodox, but compelling strategy for like-minded and bullish investors. With Micron shares changing hands at $48.34, a trader can purchase the May $50/$57.50/$65 call butterfly for $1.40. But if the May $45/$40 put vertical is sold simultaneously for $1.22, the package price is a scant 18 cents while allowing for a fairly nice bullish profile with limited risk. If MU presses lower, this investor is in position to begin accumulating shares at no worse than $45.18 or 6.5% below Friday’s closing price. And as this combination’s risk is contained to just more than 10% below $40 a share; if a crash-like move was to occur, this investor would be in a much healthier condition to take advantage of that sort of opportunity if the inclination still existed. Alternatively, if Micron starts to rally out of the current correction, the position enjoys a very nice profit profile from $50.18 to $64.82 with a max profit capture of $7.32 at $57.50 at expiration. Of course, if MU ramped back through its high of $63.42 and above the $65 call strike, this investor would feel cheated by more than the 18 cents spent. I get that. Then again, that seems like a very reasonable risk and the only sacrifice more of a mental constraint than a likely possibility on the price chart. Investment accounts under Christopher Tyler’s management currently own positions in Micron (MU) and its derivatives. The information offered is based upon Christopher Tyler’s observations and strictly intended for educational purposes only; the use of which is the responsibility of the individual. For additional market insights and related musings, follow Chris on Twitter @Options_CAT and StockTwits. 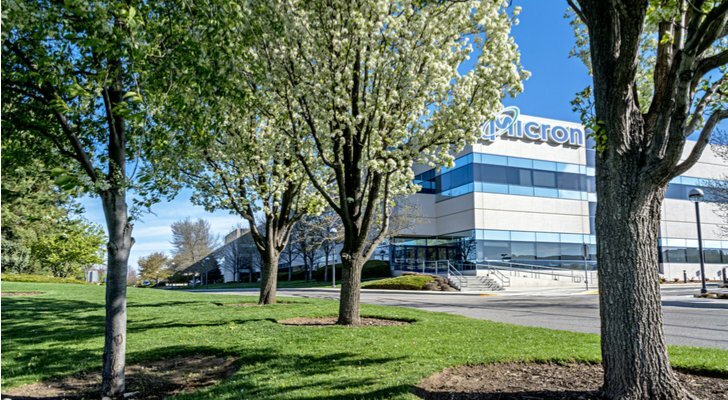 Article printed from InvestorPlace Media, https://investorplace.com/2018/04/micron-technology-inc-get-long-but-get-creative-in-mu-now/.